My Heart Got Broken. AGAIN. For those of you who are new to Claire Your Mind, you might not know that I've had an on-again/off-again relationship with this guy named Acting. He’s the ONE man-child from my past I just don’t know how to FULLY shut the door on, despite how much he's toyed with my emotions for as long as I can REMEMBER! And I think it's important to mention that I'm also in love with this other guy I've been seeing for almost TWO YEARS now-- his name is Life Coaching. Life Coaching fulfills and rewards me EVERY DAY, and feels totally secure in our relationship when I sporadically escape to Fantasy Land with Acting. So LC and I were having a pretty AWESOME 2018. Clients were flocking to us, excited to start a new year on a new foot. And please don't mention this to him, but I also decided I was going to have a new attitude about dating real humans... I reworked my thoughts on the whole process, and as a result, I've been having a prettttty fun tiiiime. And thanks to Life Coaching and the amazing tools he offers, I decided to shake more shite up in my daily routine by taking on new hobbies like hip-hop and reading a novel in my downtime instead of self-help books, giving both my brain and body new ways to have fun and learn. Suffice it to say, despite derailing a cleanse I have every intention to legitimately take on again soon, I'VE BEEN IN THE FLOW, YO, and have truly been loving every minute of it. I HAVE AN OPPORTUNITY THAT MARY CLAIRE BYRNE WOULD KILL FOR. Seriously. This could legitimately have been cause for my shining moment on DATELINE NBC. But a different TV show just so happened to be looking for an actress in her 30's to do TWO THINGS I'VE ALWAYS WANTED TO DO DURING THE 16 YEARS I'VE BEEN ON AND OFF AGAIN WITH ACTING. It was going to change my life for two months-- I'd get to escape to NY and see all my loved ones and be on Cloud 9! All life events were leading to THIS. MOMENT. I prepped a KILLER tape in very little time for casting, and they responded promptly saying that the work was great and mentioned "what a pro" I was to get it to them so quickly. This was GOING TO HAPPEN!!! I joked with my actress friends who could all relate that there are just certain roles you audition for that you couldn't POSSIBLY imagine ANYONE else playing because CLEARLY it was written for YOU. So when I received the news that I DIDN'T get the part, it felt like a guy breaking up with me, who I couldn't imagine my life without. What better connection could he find than the one he had with ME?! At this point, I wouldn't blame you for thinking what a classic, full-of-herself, delusional, self-involved actress this Claire Your Mind chick is. I was ALL OF THOSE THINGS in this situation! I hadn't learned my lesson, and I STILL HAVEN'T, WHICH I ACTUALLY THINK IS A GOOD THING! But the truth is, I'm DEFINITELY GOING TO GET MY HOPES UP AGAIN WITH ACTING, knowing FULLY WELL he will let me down again. I'm also going to keep dating, knowing fully well that my heart could be broken many more times again. Because my deepest desires to perform dream roles and to be in love with the RIGHT person REQUIRES me to take those big, vulnerable risks. I've never settled for mediocre in my career or love-life. No amount of money could chain me to a desk in a job that doesn't fuel my soul, and checking off the white picket fence with a hubby and two kids boxes just because I hit 28, was never going to happen with Mr. Wrong. So the price I pay for shooting for the moon every day involves INEVITABLE disappointment, which my own coach, Brooke Castillo, reminds me is all a part of the HUMAN experience! So this particular outcome of not booking the job was PERCEIVED as a negative one AT THIS POINT IN TIME. Kinda like all the break-ups that gutted me, which I can now look back on and say, THANK GOD I'M NOT WITH ANY OF THEM TODAY! I was super disappointed, but the good news is that I ALLOWED MYSELF TO BE DISAPPOINTED, WHILE STAYING IN MY LIFE. 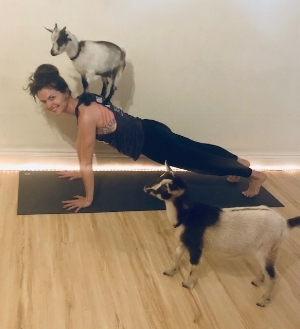 Despite the mild temporary depression, I had an AWESOME weekend that included yoga with baby goats, (just when I couldn't be more LA!) coaching amazing new clients, and QT with the quality loves in my life who understood how brutal this particular loss was for me. BECAUSE I DIDN'T GET IT. It's THAT SIMPLE, my loves. This is where FAITH plays a huge role in surrendering to that which is out of my control. When you argue with reality, you suffer. But only 100% of the time. A close actress friend who supported me through this disappointment, told me to mark my calendar three months from now, and take note of all that's unfolded in my life until then. I'm excited to see what happens, knowing that none of it could have unfolded if I left LA. This doesn't mean I don't still mourn the role or that if they changed their minds and offered it to me, I wouldn't take it. It just means that I'm not going to allow myself to be a victim to my circumstances after SO MANY YEARS of doing so. That feels FREEING as F*%#, and I'm excited to share what unfolds mid-May, now that I'm FINALLY beginning to understand how to play this game we call LIFE to my advantage....painful bumps included. Happy Claire Your Mind Monday, my loves. PS Interested in working with me? Email me at claireyourmindcoaching@gmail.com for your FIRST FREE SESSION.